Crispy Smashed Za’atar Potatoes are an easy and fresh side dish with a unique flavor! Do you receive the Overtime Cook newsletter? Full of recipes, kitchen tips and deals and more! One of the great things about being a food blogger is the community – the people you meet, the friends you make …it’s an amazing thing to be a part of. One of my Kosher foodie friends is Kim Kushner. You may be familiar with her instagram, @KimKushnerCuisine, or you might remember her as the incredible hostess behind the #KosherFoodiePotluck I was lucky enough to attend the last two summers. 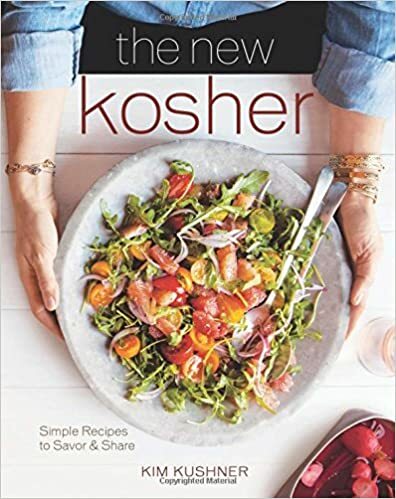 Well, Kim released her second cookbook, The New Kosher, right around the same time as my cookbook came out, and I am so excited to introduce her book to you today. Kim’s theory in The New Kosher is that kosher food doesn’t have to be about heavy, greasy, sugar-laden dishes. Kosher food can be so much more than pastrami and kugel. Kim uses fresh ingredients and modern flavors to give you a whole new repertoire of recipes. Take these potatoes for example. The ingredient list is marvelously short, the instructions are simple, the flavors are exciting – it’s modern kosher cooking in the best way possible. Preheat oven to 425. Line a baking sheet with parchment paper and set aside. Place the potatoes in a large pot and add cold water to cover. Bring to a boil over high heat and stir in one Tablespoon salt. Cover the pot, then reduce heat to medium and cook until the potatoes are fork tender, about 10 minutes, depending on size. Roast the potatoes until golden and crisp, about 10-15 minutes, depending on how crispy you like them. Remove from oven and sprinkle zaatar over all of the potatoes. Optional: return the potatoes to the oven for another 5 minutes after adding the za'atar. Want to own The New Kosher? Sure you do. Buy it here on Amazon. I decided to share this recipe with you today in honor of a fabulous social media campaign orchestrated by Jewish bloggers in support of Israel. #LoveIsraelFood is all about sharing our love for Israeli food while trying to impact change in a country that is very special to our hearts. I urge you to join along by buying, cooking, baking and sharing Israeli products and food (such as the za’atar in this recipe!) and use the hashtag #LoveIsraelFood! These potatoes are best eaten fresh, but you can store them in the fridge for a day or two. Reheat in a single layer on a sheet. Have you bought my cookbook yet? It makes a great gift! Click here to purchase Something Sweet. Disclosure: I was provided with a review copy of this cookbook. All opinions, however, are my own. This post contains affiliate links, which means that a small percentage of every purchase made through that link goes to help support this blog. What is za’atar and where can I get it?